Season 1. Episode 4 with Hugo Perez. Listen to the podcast. Don't forget to subscribe! Announcer: Welcome to the Rethinking Football podcast, where we discuss player development with players, world renowned scouts, professional football academy directors, coaches and others. We will use Spain’s model and compare it to other national governing bodies in other countries. At the end of each podcast we will update our theory of change to improve player development worldwide using indicators, best practices, and our own research, along with the opinions and expertise of our guests. Soccer Hall of Fame inductee, Hugo Perez, is a legend and a true agent of change. Perez was part of the generation that influenced tens of thousands of football lovers in the U.S. Perez was born in El Salvador and grew up in Southern California. During his 14-year-career as a professional footballer, Perez earned 73 national caps including the Olympic squad. He was a member of the 1994 U.S. World Cup team and was starter in the unforgettable Round-of-16 match against Brazil. He also had a chance to train under the tutelage of Johan Cruyff at Ajax. As a coach, Perez has been credited as the architect of the most talented U.S. Youth National team in history. The graduates from his U.S. U-15 boys national squads (between 2012-2014) represent some of the players that can potentially shape the future of the USMNT including Christian Pulisic, Andrew Carleton, Josh Perez, Tyler Adams, Lucas Del Rosario, and Jose Carranza. He also brought Jonathan Gonzalez to the U.S. National Team program. Perez talks about solutions that can improve talent scouting, player development, and coaching education. Host: Welcome to Rethinking Football. My name is Dawn Brown. Today we are going to have a conversation with Hugo Perez. Hugo has an interesting story. He is unique because he was a dual citizenship player who played for the US national team, and he was also a coach. Prior to this interview we had a chance to talk about philosophies on football and today we are going to expand on that conversation. So welcome Hugo. Host: Let’s start with your experience with the US national team both as a player and a coach. I’d like for us to look at the difficulties that young players face today when considering playing outside the US, whether they have dual nationality or not, and what some of the advantages and disadvantages are. You’re part of the generation that is responsible for elevating the sport of soccer in the US. What do you think is better now for US athletes hoping to become national team players? Guest: The advantage today is that I think that we have a expansion program on national teams for the US, than it was before when I played. We have better programs all over the country, more youth clubs all over the country and before when I started playing here, especially with the national team, we didn’t have all that. Now the difficult thing I think sometimes continues to be what type of players coaches are looking for, and in the national team especially, that all depends on what type of coach the national team has. But when you talk about infrastructure I think that It’s much easier now for players to be seen than it was when I played. Host: Why would a US youth player or early career player consider playing outside of the US? Guest: There’s a couple factors. One obviously the players right now, the youth players in this country, they do have I would say the talent to be able to go outside and play in Europe for example, but we have to remember here in America the culture is a little bit different when it comes to football. And it all depends also on the parents and on the culture of the kids that they are growing up with, and the environment and what their goal is. Also, we need to remember that here in America soccer is not part of a deep culture OK? So that gets in the way a lot of times, because some of the kids want to go to college. 95% of the kids that play in this country go to college. So, it’s a little bit different here than in Central America and South America where everyone wants to be a pro and play at the highest level. Here in America it’s more challenging but there are also kids that have the same and have the dream of playing in Europe. But also, we need to take into account now that obviously with the FIFA rules now, kids cannot go with the younger ages like they used to. It has to be 18 years old before they can sign over there. But I think that’s going to change through the years as soccer gets more popular here in the United States. You want to have more kids dreaming of playing in Europe because whether we like it or not, I think Europe is still the elite continent where our players can go and prove themselves how good they are because football is higher there than it is in the rest of the world. See what it's like to be evaluated by Hugo Perez! Host: You make a great point about how the FIFA rules limit what can youth can do overseas. Let’s talk a little bit about that. How do we prepare our youth players to go to Europe when they’re old enough, say 17 or 18, so that they have the right level and the right tools to be successful in the European system? Guest: Right now here in United States we have the Academy program that is backed up by US Soccer that is connected also to The MLS franchises. I think that’s been a help and making sure that our players are getting recognized and they are playing and competing in the league. But I still think we can do a better job, especially in the Academy system, where you have to focus more on the development of the player than the result of the games. Again, when you were going to Europe and you’re sending young players to Europe, they need to be prepared and be more than a one-dimensional type of player. And at the end the academies have to be the foundation of the gene that prepare these players technically and tactically. So, when they get a chance to go to Europe, they’re aware of and they’re better groomed and they’re better types of players because again the environment over there, it’s competition week after week. There are so many players, so I still feel that we need to do a better job here in their development process especially, at the youth level, and not to worry too much about the results as an Academy because at the end you want players from our country especially to go to Europe and succeed because that helps the national team players overall. At the end also the MLS academies, they continue to do a good job. They could probably start thinking also about selling players like everybody else does to Europe, but we need to concentrate on the development process more than the process of results. Host: Right. One of the things too that is different here in the United States as opposed to Spain or other countries is that we don’t use the promotion and relegation system, for both youth and for the professional leagues as well. What kind of difference do you think it would make if the youth academies and youth system here in United States adopted a relegation and promotion system? Guest: It’s been discussed for years about that and they feel that at the youth level also. Now there’s some leagues in Southern California that have promotion and relegation. And I am not against that. The only thing that you also have to be careful of, and this doesn’t have anything to do with promotion and relegation, has to do with the person who’s coaching the teams, or who is coaching the youth players. Because when it comes to promotion and relegation we focus a lot on the result OK? Because they need to win to stay in the first division or second division, and so that sometimes gets away from having the opportunity they have to give the players to develop in themselves. Because now it becomes a game of results, and when you have that the player is sacrificed. In other words, you want to minimize the mistakes of players, and when you do that you take away their freedom to play. But also, I like promotion and relegation because the coach who is coaching those games really has the burden to be able to make sure that his players are competing, and they’re being developed even though you have to do a promotion and relegation. So, it all comes down to the club and it comes down to the coach and also it becomes part of the responsibility he has to be with the league. There’s got to be ways that the league can say OK we don’t have promotion and relegation, but we need to make sure that our players are getting developed the right way and not being sacrificed just to get a better result. Host: Do you think problem is that we don’t have enough formative academies in the US? Guest: Yes. That is a problem we have so many youth teams in this country. But at the same time, because it is a pay to play issue, it becomes sometimes a problem. Now I still believe that every youth club in his country, whether they have a pay to play program, you still have the ability to do a good job and I think this is where I feel that US Soccer has to intervene and help clubs focus. I’ll give you an example. If I have a small club, whether it’s in the Academy system for example, or outside the Academy system, if I’m doing a good job of developing players. Let’s say I send a player to a youth national team camp, and he makes it there, and he makes it for the U17 world cup, or the U20 World Cup, and he came from my club, I think the club should be compensated for that. Because that gives the desire for clubs to continue to work that way because now they have developed the players. So, the club should be rewarded for that, whether it’s an MLS club that does that or the US Soccer Federation, because that’s an incentive for coaches to be able to work and do their job, as far as developing players and that would help our soccer over all in this country especially with the youth clubs. And I think that should be a thought that a team has to think about going forward because the academies in this country that are affiliated with youth soccer, there are about 90 to 110 I think, but would you think about our country here, how many youth club there are, there’s thousands of them. So, we need to make sure that we include those clubs that are outside the Academy and keep an eye on them and give them incentives so that they can do a good job and develop players. I mean, they get to the national team or they get signed by a professional club, they should be compensated for that. And that would help the overall structure of developing players. Host: We will continue our conversation with Hugo Perez after this. Host: You mentioned that there’s maybe 90 to 100 academies in the US. As you said we are a really big country, so what do you think could be done better at the local level to identify talented players and then connect them to the right academies and the right coaches, in order to give them a better shot at a path to professionalism? Guest: Look, I think again that when the Academy people talk about, we want to make sure that the academies are strong, and we want to make sure the Academy games mean something. I get that, I understand that. I still feel that the only way to reach outside clubs from the Academy system is to get them involved. I always thought that in certain parts of the country, where the volume of players is big, I think US Soccer should try and regionalized those places, and have more academies involved. Because at the end when you have more Academies involved, you look at more players. And I tell you the truth, I was in Spain five years ago and I spoke to the people in Barcelona, and the Barcelona academies, la Masía, obviously they compete at a local league. And a lot of the clubs are not professional sometimes. Especially at the youth level. But they compete against them and that gives them the advantage to look at players that they might not see or that their scouts might miss. That’s one way to do it here, to have more clubs involved. Now, if they cannot be more involved for example, in the Academy process, then what they should do is, youth soccer should reach more of those clubs outside of the Academy and have a program for them. Have scouts or people that work in US Soccer come once or twice a month to do training centers for them. So, they can invite their best players and you can see them also. That’s why with the Latino community, the years I worked in US Soccer, I did that. I went outside the Academy program and started doing training centers in Latino places where I could reach all these Latino leagues and ask them to send me the best players. And I would come for two nights and look at the best players, and sometimes we saw players that probably never would have been seen, because they were not in an Academy program. And that way we can reach all these people. But US Soccer has to really implement some kind of a system and hire the right people that can reach those people, to be able to have more access to our youth players. Host: Hugo we have some players from the US who have gone through the Academy system in Spain and they are playing now in the Spain system, playing professionally at different levels. What do you think is the advantage for them for having been part of that system? Guest: Do you mean being part of the Academy system here and going overseas? Host: That, or for a few players, who have been able to be in a youth system, I think about three, who have been part of the Academy system in Spain, who are US players. And now they have graduated to professional level. What do you think are the advantages for them having taken that path instead of staying in the Academy system here in the US? Guest: Well the advantages, I don’t think we can compare. First of all, I still think the best youth players, depending on what their dream is, if they are talented enough, it’s always beneficial for them to go younger to Europe. It would always be for so many reasons. The culture, the environment, being in an Academy where the first team is playing every Sunday, where the atmosphere is big, where the environment, training and competing everyday, asks you to be the best every day. We don’t have that here. Our Academies here aren’t as difficult to put that into what they do and how they do it in Europe. There’s still a long way to go there. So, it’s always going to be an advantage for our players to go there at the young ages. Now, also I can tell you this, from personal experience, I think the Academy experience here is good, but I always emphasize that the best players have to be playing with older kids or have to be playing with adults. Because that’s the way you develop sometimes, most of those players are a little bit faster. Or again going overseas at a young age and living that experience, because obviously when those kids get there, the hardest part is for them adjusting to a different life, a different culture in Europe than it is here. Some of them have been born here and then they come back because they can’t adjust to the type of life that you live in Europe, especially at a young age, where they don’t have all of the things they have here in America. So that’s a big issue for them. But the ones that have that strong mentality and are talented enough, I think they’re always going to be ahead of the other ones that stay here. Host: What advice would you give to coaches, both seasoned and new coaches, on how to develop youth players and help them reach their full potential? Guest: The most important thing I think, is we as coaches here in America, we need to be raising the bar. What is the best thing we can do for our kids? How can we elevate our level? How can we help our kids become elite soccer players and put them in countries where you have the top teams in the world? I think that would be my message to every coach in the US, whether professional or with the youth, because I personally believe we as coaches sometimes put first our own teams before our players. Especially with the youth, and I think that needs to change. And we need to be more humble. We need to be more open about learning from people that are better than us. I think that would be my message. Host: That’s great advice Hugo. This concludes this episode of rethinking football. 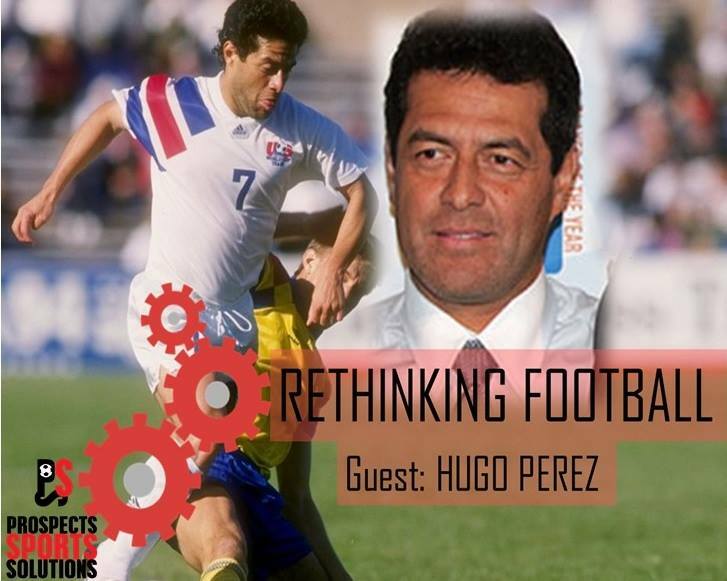 Join us for the next episode when we will continue our conversation with Hugo Perez and discuss US youth players who choose to play on teams outside the US, and what the advantages are for players who make that decision. Announcer: To access the transcript of this podcast and other archives, please visit our website www.prospectsss.com and click on podcasts. That is prospect SSS.com. If you enjoyed the show, subscribe to get the latest episodes directly to your device. This episode is brought to you by PSS international Academy. Research shows that in sports, the one thing that works and makes lower performing players better is immersion. To learn about our programs and how you can play federated football in Spain, visit prospectsSS.com and click on international academies. Don’t forget to follow us on Twitter @rethinkingF. Rethinking Football’s theme song, Actionable, is courtesy of bensound.com. Receive periodic updates about PSS's latest success stories and website improvements by subscribing TODAY!